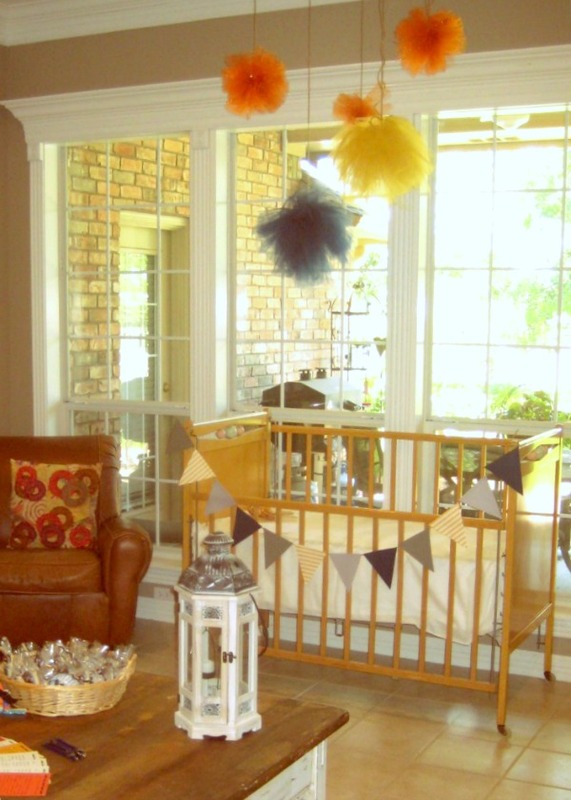 Little man baby shower: garland, tulle balls, menu & food labels - C.R.A.F.T. I showed you some of the fun stuff yesterday, but today I’m giving you the deets. The little man shower decor, for the most part, was done all in one day. Marnie was the proactive hostess (there were 5 of us!) 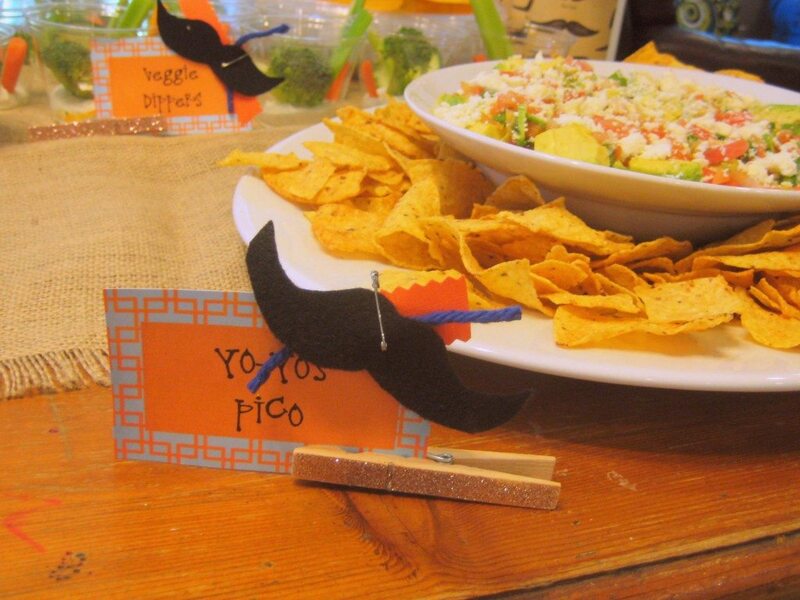 who whipped up some crafty goodness in advance including: mustache & bow ties on sticks, cupcake stand, silverware holders, mustache plates and cups and she brought scrapbook paper, and twine to the baby shower eve craft night. We couldn’t have pulled it off without her decor fore thought. My mom was also essential in operation little man shower decorations. Thankfully, my mom is use to my extra messy crafting style and her house is always fully stocked with craft essentials. 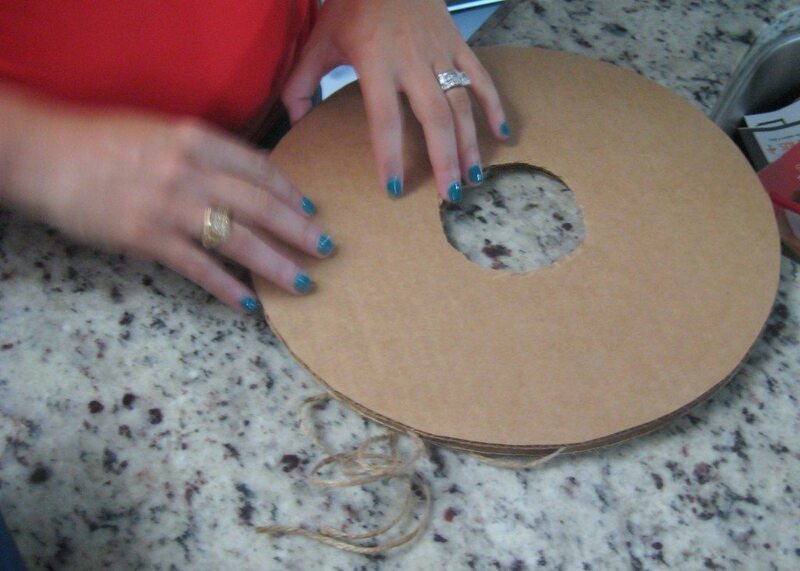 She is also a super star at resurrecting my craft disasters and assisting to make my visions turn into reality. Annie (the guest of honor) was another major player in her own shower decor! 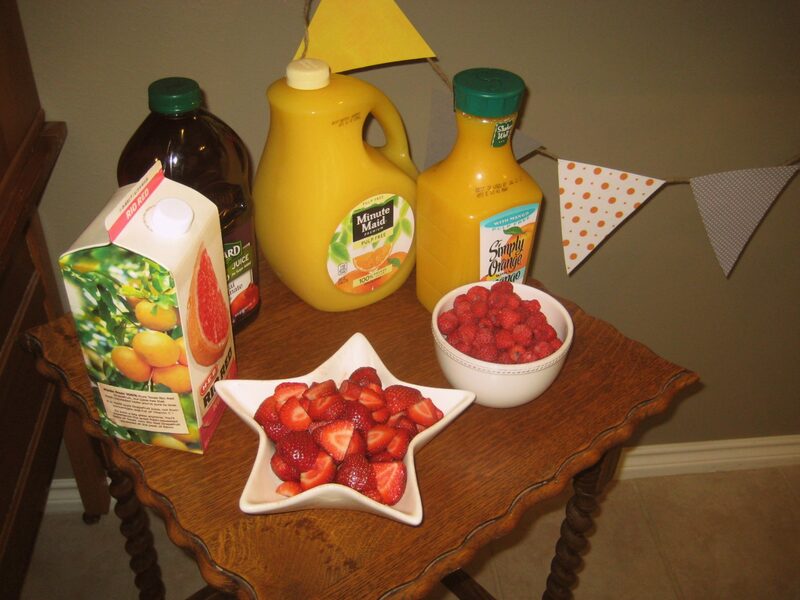 Lucky for us, not only is she good at putting together fancy fiestas… she loves it!! 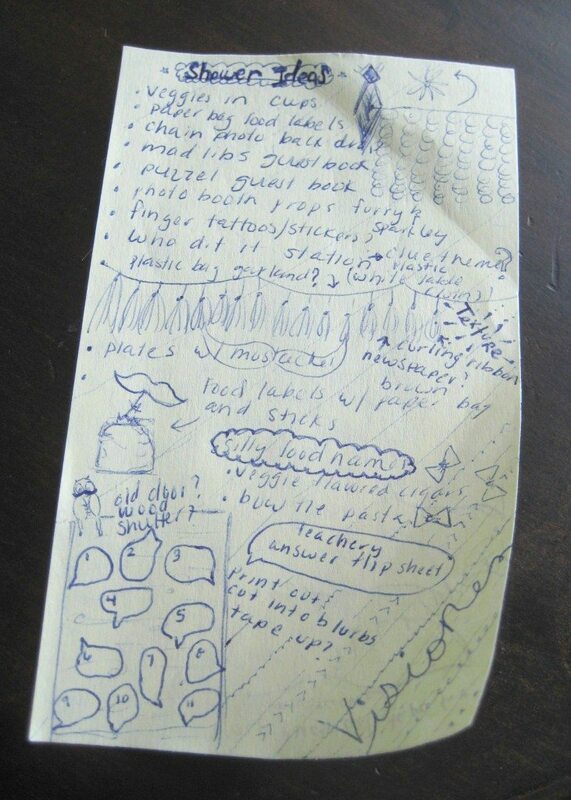 The mad lib gust book (more on that Friday) was the one completed craft I had with me when I arrived in TX. 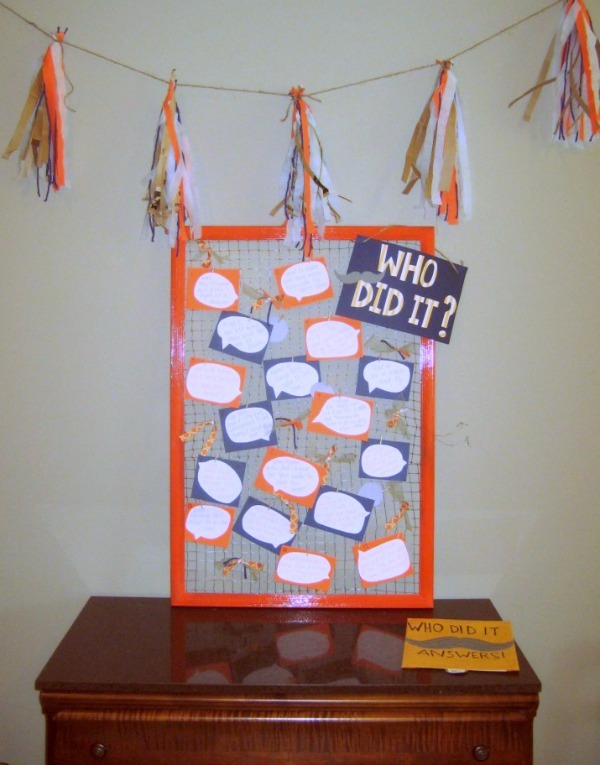 Oh… and I had e-mailed the mom’s about the “Who did it?” game. But, other than that the shower was all just a vision in my head upon deplaning in TX on Friday morning. Saturday was the shower. Ah! Next up was tulle pom pom’s. We speeded to Hobby Lobby (something we don’t have in South Florida!!) 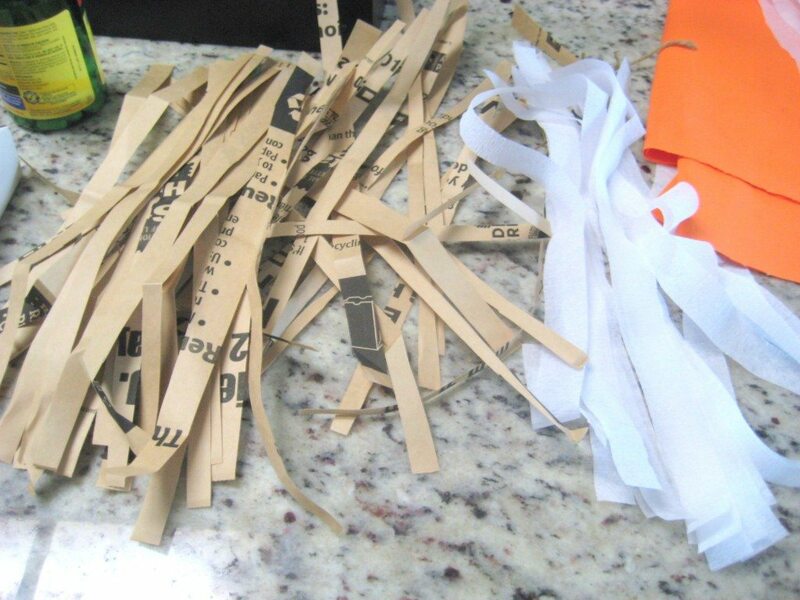 for tulle ball materials. We wanted to make 5 balls of different sizes for above the crib of gifts. None of us had ever made large tulle balls, and had no idea how much tulle to buy. We opted for 4 yards of mustard and navy and 2 rolls of the sparkly orange. (I didn’t even realize tulle cam in rolls!) Just an FYI, if you have time order from Amazon, it’s cheaper. 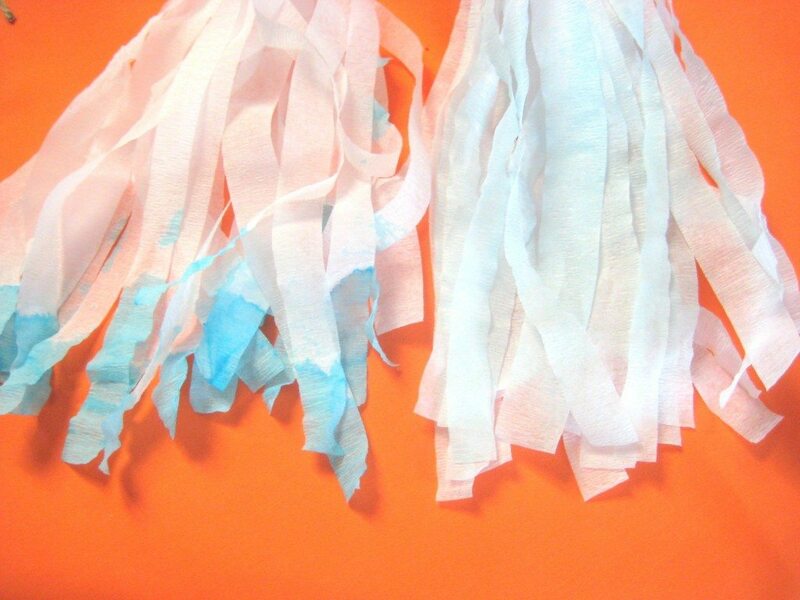 (here is an orange tulle roll for $2.98, but I can’t see how many feet is on one roll and here is another orange tulle roll for $3.59 with 75 feet of tulle). 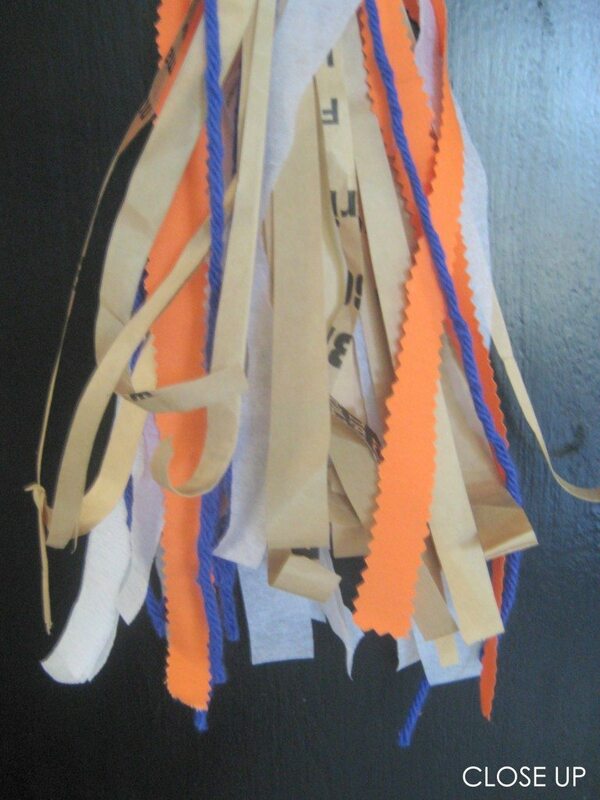 The mustard and navy had to be cut into strips, while the orange was already the right width on the roll. Another thing about the tulle on the rolls is that it was stiffer than the tulle bought by the yard… this made for fuller pom poms. 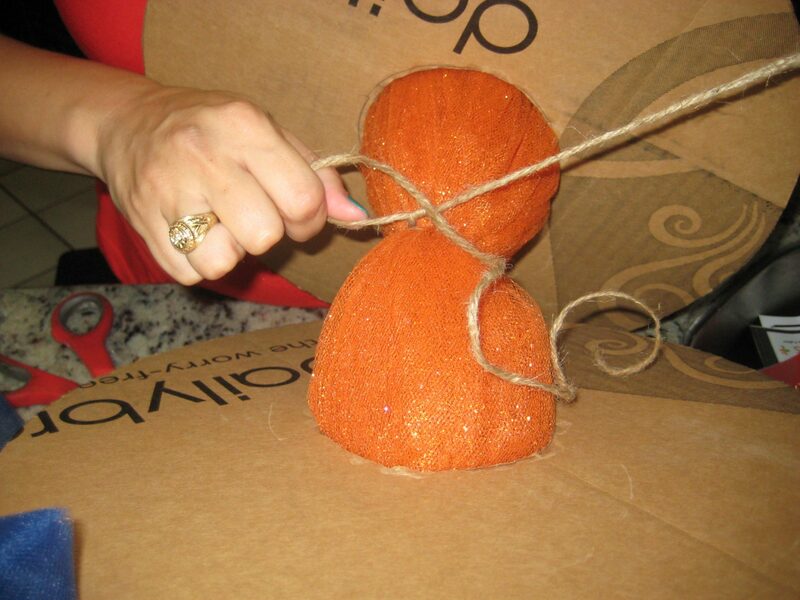 For the small orange balls, Annie cut out circles from old cardboard. I’d guess our circles were 12 in. in diameter. My decoupaged life has a good tutorial if you want to see the play by play. The scrapbook bunting was a Sabrina/ Jamie/ Marnie project at operation little man craft night. Marnie brought all of the coordinating scrapbook over, I cut out all of the triangles, and Sabrina taped and arranged the bunting on the twine! 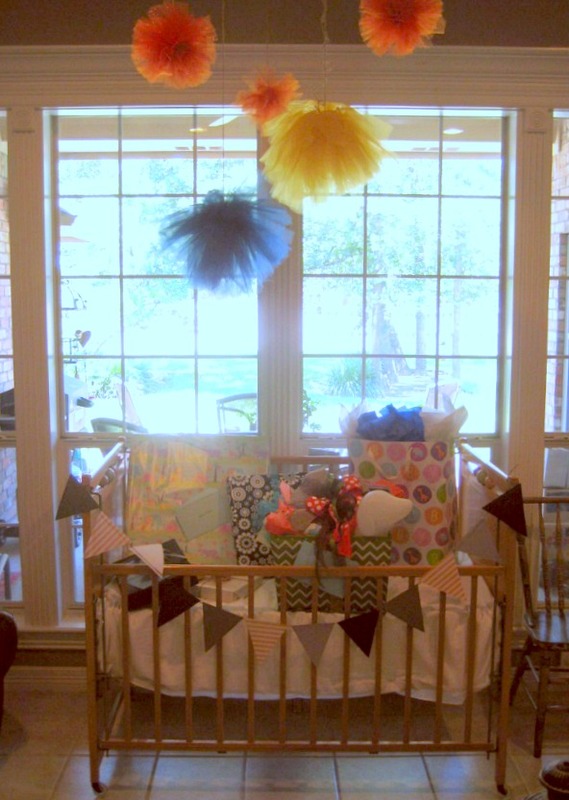 I love it on the crib… arranging was a group effort. Moving on to food and drink labels… Annie made the food labels on the computer with her scrapbook software and printed them out on card stock. The hardest part about this project was defining the menu… ha! Vikki, Marnie, and Sabrina were the menu makers, chefs, and bakers! I contributed one (super duper simple) food item (to be seen shortly). 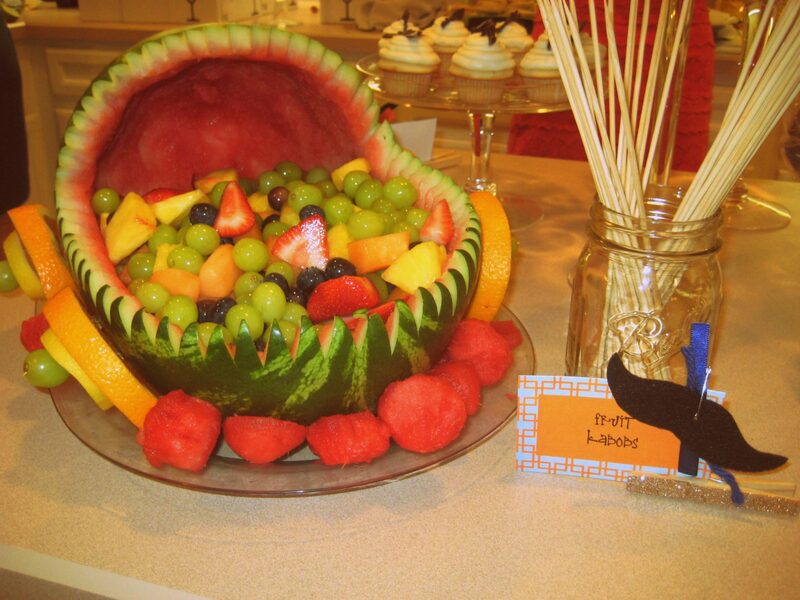 Each label was printed on card stock with a fun border, I added a few scraps and a felt mustache, and Annie glittered some clothes pins… pretty simple, but definitely added a little pa-zazz… How fun is this watermelon baby carriage for make your own fruit kebabs! 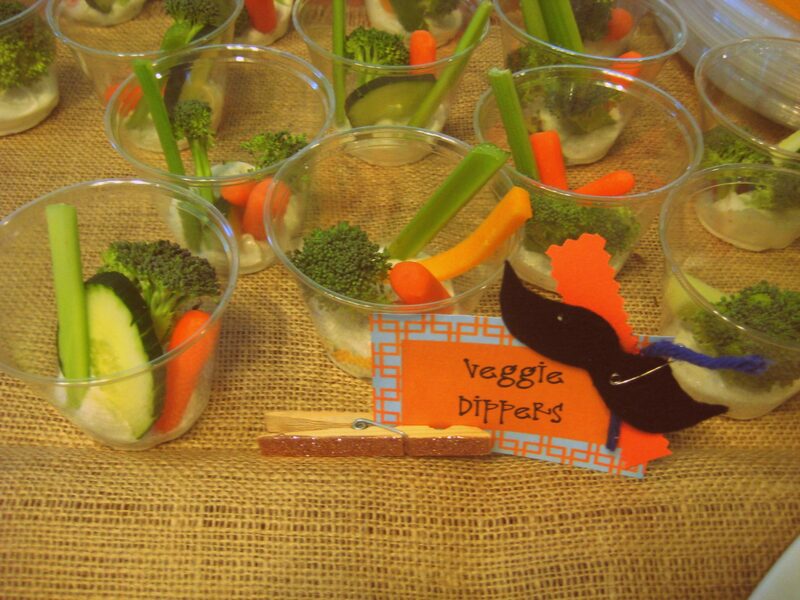 Here is my one food contribution… individual veggie dip cups… I first saw the idea here… it’s perfect for a party because you can pick one up and eat ’em with your fingers. 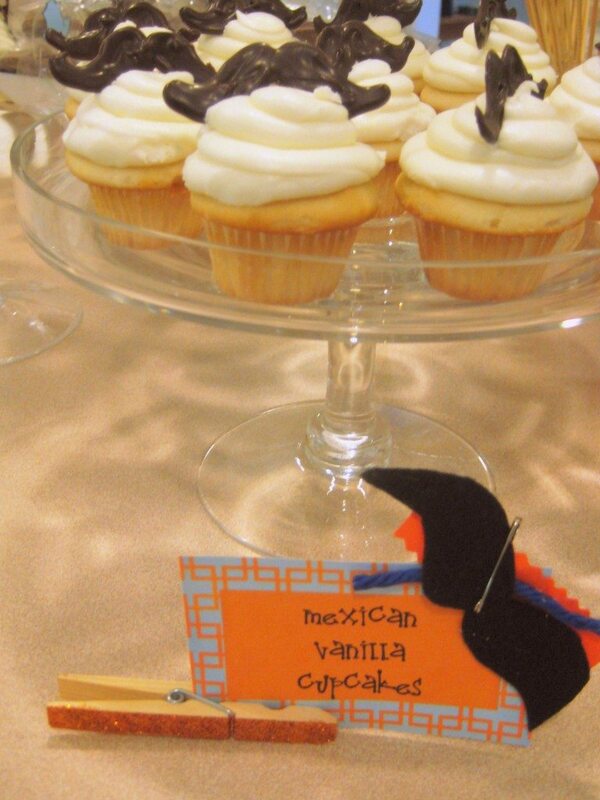 These tasty treats were baked by Vikki’s sister in law, Jenny Rudder Baer. 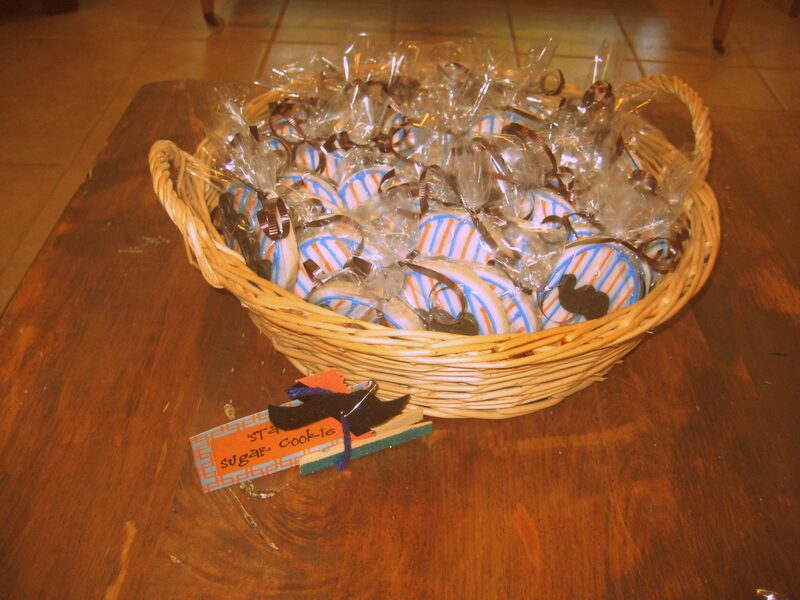 Annie hand crafted the chocolate ‘staches! Vanessa was in charge of “wettin’ your whiskers”… we had lots of alcoholic and non alcoholic options available… The cups even had cute little mustache stickers! Everything looks amazing! 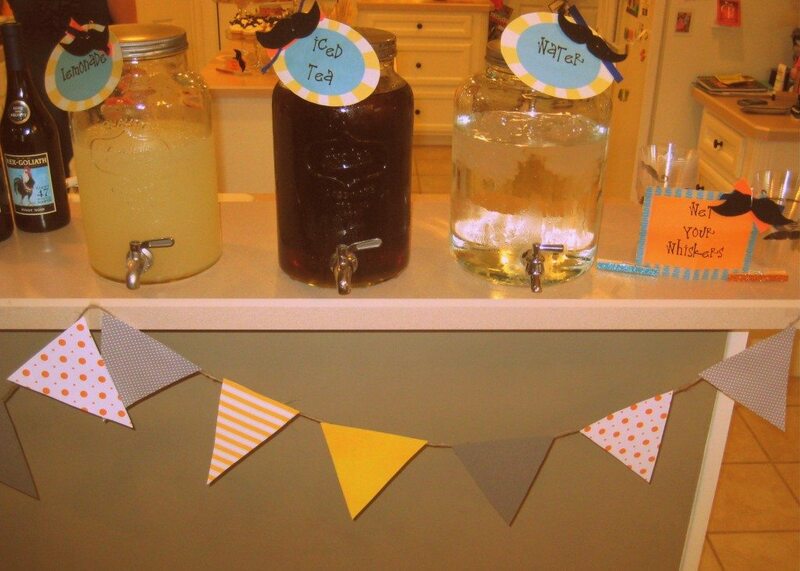 What a fun baby shower idea. And I’m glad you were able to use my tutorial! What an adorable shower! I love the theme you chose. Super cute.